Scotland, Catalonia, Northern Ireland, Quebec –Western regions with distinct histories and linguistic identities, which have at times also experienced violent episodes of nationalism. 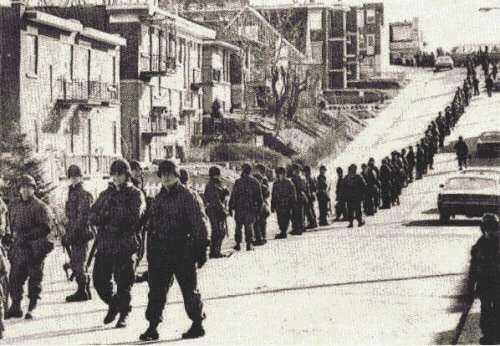 For Quebec, the month of October in 1970 was its darkest hour, as the Front de Liberation du Québec (FLQ), a separatist paramilitary group formed in 1963 advocating the creation of an independent Marxist state of Quebec, targeted the government, English speakers and business, and the Catholic Church, which were viewed to be suppressing French-Canadian interests. Bombings of mailboxes by the FLQ were common throughout Quebec from 1963 to 1970, but other targets included the Montreal Stock Exchange, Montreal City Hall, police offices, railways, and banks. Earlier in June 1970, police raids of a cottage in Prévost, Quebec discovered firearms, ammunition, and leaflets of plans for the kidnapping of American Consul General in Montreal, Harrison Burgess. On October 5, 1970, two members of the FLQ’s “Liberation Cell” kidnapped British Trade Commissioner James Cross outside his home. The FLQ demanded the release of detained FLQ members and the public broadcast of the FLQ Manifesto which criticized business, religion, and the political leaders of Quebec and Canada. Then on October 10, Pierre Laporte, the Quebec Minister of Labour, was abducted by the “Chenier Cell” while playing football with his family in Saint-Lambert. Thus began the October Crisis. Fear grew among Anglophones in eastern Canada as many politicians and businesspeople started to travel with bodyguards. Commercial areas were closed off and the army was brought in to patrol Montreal and government buildings. With increased difficulty in maintaining civil order, the Quebec Government asked the Canadian army to formally intervene. 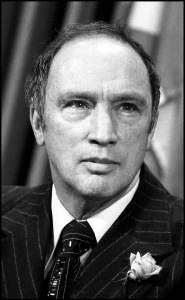 Prime Minister Pierre Trudeau invoked the War Measures Act, the only time it was used in peacetime in Canadian history, which allowed the government to suspend civil liberties. Police were given very broad powers to apprehend and question individuals they thought were associated with the FLQ without warrant, which led to the arrests of 250 suspected FLQ members and sympathizers within a 12-hour period. The situation took a turn for the worse when on October 17, the “Chenier Cell” announced that it had murdered Pierre Laporte. On November 6, police raided the hideout of the “Chenier Cell”. While some were detained, others managed to escape. The government also negotiated with the “Liberation Cell,” reaching an agreement on December 3 ,which saw Cross’s release after 62 days in captivity in exchange for safe passage to Cuba for the Cell members. Only eight individuals were convicted of crimes associated with the October Crisis. Federal troops in Quebec were withdrawn on December 24. After the October Crisis, there was a decreased support for violence in the Quebec separatist movement. Referendums in 1980 and 1995 regarding the sovereignty of Quebec were both voted down, thus keeping Quebec in Canada. The strength of the sovereignty movement in Canada today remains a subject of debate. In an extensive interview conducted by William D. Morgan starting in June 1999, Vladimir I. Toumanoff discusses the atmosphere in Canada during the October Crisis. Michael M. Mahoney and Ambassador Thomas M. T. Niles were interviewed by Charles Stuart Kennedy in October 1995 and June 1998, respectively, regarding Quebec’s 1980 referendum on separatism and the state of the issue. More recently, David T. Jones was interviewed by Charles Stuart Kennedy in March 1999 on another referendum on Quebec sovereignty in 1995 and the sentiments around separatism in the 90s. You can also read Toumanoff’s gripping account of the trial of Francis Gary Powers and how he almost became a victim of McCarthyism. You can also read about Scottish nationalism. TOUMANOFF: One thinks of Canada as a stable, somewhat staid society. Such, emphatically, was not the case during my tour. Three elements coincided to produce turmoil. One was Pierre Elliot Trudeau (at left), the “JFK of Canada,” newly elected Prime Minister, young, energetic, glamorous, brilliant, charismatic, eloquent in both national languages, but with an attitude toward the United States of an arrogant French intellectual aristocrat — in a word, scornful dislike. Be it said we were not all that likeable- – in the midst of the Vietnam War, with Nixon as President, and almost absentmindedly an overwhelming cultural, economic, political and demographic threat to the sanctity of Canada – 20 million people spaced out like small beads on a long thread along the border of 235 million Americans, a megastate by every measure. Another was an alienated French Québec so resentful of real and imagined oppression and injury at the hands of English-speaking Canada as to be on the verge of secession, with an impact something like having the Mississippi watershed secede from the United States, with no common language. And finally, a burgeoning Canadian nationalism, anti-American and anti-Québec in the English provinces, and assertively anti-Anglo and pro-independence in Québec. The alienation of the French Québecois was so intense it had already spawning the terrorist FLQ the Front de Liberation du Québec, loosely but accurately translated as the Québec Freedom Fighters, which had started blowing up mailboxes with sticks of dynamite by the time I came to the Embassy. 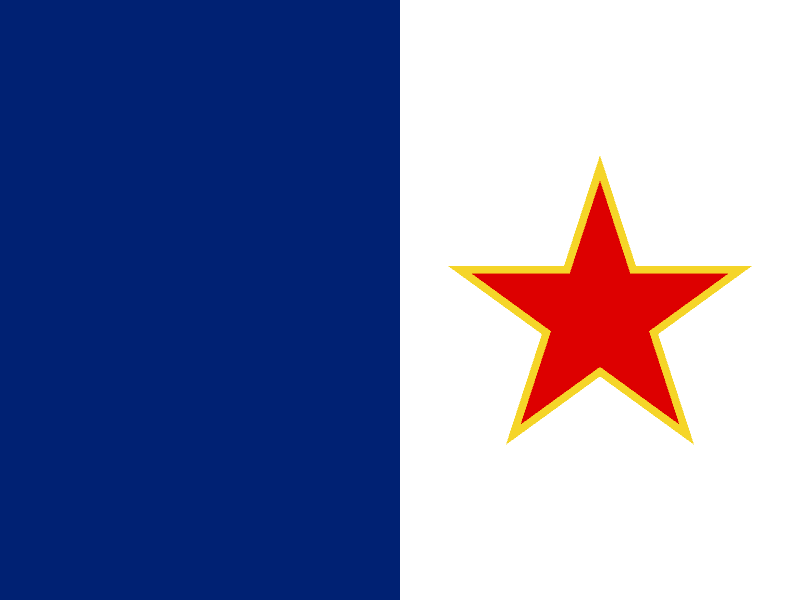 The pro-independence political party, which disowned the FLQ, was the Parti Québecois. It had a near majority vote in the Province and had provoked a constitutional crisis. Trudeau’s imperative task was to combat Québec separatism and preserve the unity of Canada. To that end he pursued a three-fold program: to stimulate Canadian patriotism/nationalism; to portray the United States as an ugly, aggressive giant constantly threatening to overwhelm Canada; and to assuage and accommodate Québec as a treasured and protected unique component of Canada. 2) To persuade French Québec that independence would leave them isolated and surrounded by a resentful and vengeful English Canada and a giant America, a tiny French island of barely 4 million in a gigantic sea of 250 million Anglos. What chance had they of preserving their French culture from being overwhelmed and expunged. Better to stay in a caring and accommodating Canada…. Now about terrorism and the Front de Liberation du Québec (FLQ, flag at right)… By the time I arrived to take up my duties at the Embassy in Ottawa, which was about September of 1969, the FLQ was planting bombs, fused dynamite sticks as I recall, in public mailboxes in Québec and blowing them up. Then came the worst. A Volkswagen in Montreal ran a red light, was flagged down by the police, the driver jumped out and ran, escaping. In the car the police found a stack of FLQ posters proclaiming that they had kidnapped the American Consul General in Montreal and were holding him hostage. Their demands were something along the lines of immunity from arrest, publication and broadcast of their manifesto, and I think resignation of the Provincial government and a plebiscite on Québec independence. They were a bit premature as they had not yet kidnapped the Consul General, and counter-measures were immediately taken. 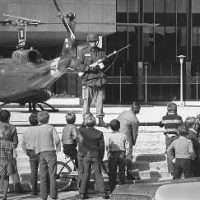 The Embassy and all our 12 Consulates across Canada were notified, heavy police guards provided, and the news of the FLQ plot widely publicized. The FLQ, realizing they had lost their chance at an American, moved quickly and promptly seized a British equivalent, I think the British Trade Commissioner in Montreal. Their demands were rejected and an intense hunt began. However, not long after, the FLQ managed to capture a prominent member of the Québec Government [Pierre Laporte], a Provincial Minister if my memory serves. Him they held in a Montreal house, tortured, and ultimately killed, evidently in his attempt to escape. They fled the house, and vanished. Some weeks later, they were caught in an outlying farmhouse. The Brit was rescued unharmed. They were tried and jailed, probably for life. Their life in prison, I imagine, was not pleasant, but they and the FLQ dropped out of public sight. They had also greatly harmed their cause. Q: And discredited it totally. TOUMANOFF: Yes, it was too savage for the Canadian culture….Too savage, even for Québécois secessionists. This was simply beyond the pale. I think there were very few, just a handful of these radical madmen prepared to act that way…. That episode in Montreal affected the Embassy and our Consulates General, so let me turn to that now. There was, of course very close contact between the Embassy and the Canadian police, the Mounties, the RCMP. But it went through a liaison group in the Embassy for systematic contact with the Canadian Government on security matters. I got involved only once. The Canadian Government had asked all Canadian print and broadcast organizations to refrain from reporting any manifestoes or other statements from the FLQ. I happened to know that a radio station in northern New Hampshire or Vermont broadcast programs in French to the large French Canadian populations in those two states, and to the Québcois across the border. So I alerted our liaison people to have the U.S. Government request that station, and any others broadcasting in French, also to refrain from carrying FLQ statements until the Canadian media did, and we told the Canadians we had done so. After that FLQ kidnapping poster the Department had to try to address the whole question of terrorism in Canada directed against the Embassy, the Consulates General, and Americans at large….Individually, we all knew we were targeted. Measures, now familiar, but then quite novel, were instituted. Guards were posted at the buildings and the residences of the Ambassador and Consuls General. For fear of a letter bomb we were told not to open our mail at home unless we either recognized the handwriting or we were otherwise absolutely confident that it was a legitimate piece of mail. If not, we were told not to open it, to touch it as little as possible, and to call the police, the Canadian federal police, the Royal Canadian Mounted Police, the “Mounties,” and we were given an emergency 24-hour telephone number which all family members had to carry with them at all times. In fact, we were given a whole lot of precautions and advice, well-intended but by and large pretty useless. We were to vary your route from home to and from the Embassy, as well as shopping and any other habitual movements like dog walking. Call taxis, vary our hours, not walk alone, look both ways every time we stepped out of your house, keep the house doors always bolted and locked, always set our home alarm system if we had one, or perhaps get one. Keep someone informed of our whereabouts and expected time of return. Travel by daylight and in company as much as possible, etc…. We were very careful with the mail, and reasonably so within practical limits in our movements. But we decided not to tell our children unless orders came to evacuate unessential spouses and children. Such orders never did, and no attempt against us or consular personnel took place that I ever heard of. I think the RCMP would have informed us of any attempt they might have learned of. But the Embassy received a couple of bomb scares in the next few months, notice by phone that a bomb had been planted in the building. We would all scramble out and stand around while the police searched the place. They never found anything and nothing ever exploded. But it did take a long time and disrupt things some. It also reminded us not to get sloppy. Another one on Québec separatism, which is doubtless buried in detail in archives, but may be worth mentioning as a reminder. It illustrates the sensitivity of that issue for Trudeau, its international reach, something of the Québecois illusions, and the weight of Canada on a global scale. The ce ntral issue for the separatists was an historic and very present threat to the survival of their French language and culture, from English Canada by both intention and disregard, and from the U.S. by its colossal influence in every sphere. They consequently turned, eagerly, to France as their mother country, for practical support and emotional sustenance. The French response was modest, lukewarm, nothing like the passionate embrace they sought. The French were friendly and recognized historic ties, but seemed somehow preoccupied with other matters, which, of course, they were. Québec sought a visit by [Charles] de Gaulle, the President of France. After some delay, Trudeau evidently decided it was better to invite de Gaulle on a state visit than to delay indefinitely and inflame the issue to a separatist battle cry. [In 1967] de Gaulle accepted, landed in Montreal to a wild, hero’s welcome, and stayed, instead of going on promptly to Ottawa, the capital, as protocol would require. 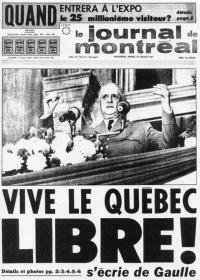 Worse, his public statements increasingly celebrated the ties between Québec and France, until in a public address from the Mayor of Montreal’s balcony to the cheering crowd below he ended a real stem-winder with the cry “Vive La Québec Libre!” – Long Live Free Québec – the separatist and FLQ rallying cry. The Trudeau Government promptly invited him to leave Canada, which he did. I read that several ways. In the first place it was a shocking provocation to all the rest of Canada. Secondly, de Gaulle must have known the economic damage separatism was already causing Québec as capital fled and investment faltered. He also must have known that his act would accelerate that damage. Moreover, he had no intention or even capability to provide compensatory support. It was a wanton act of destruction and as such a profound insult to Canada as a measure of how little importance he ascribed to that nation. The episode was also symptomatic of the illusion, more accurately the delusion prevalent in French Québec that France would somehow be the savior of their culture and shield them from their anxieties. Q: I find it particularly interesting, and I think it’s almost the root of the problem, is the way Canada was founded by two father/mother countries – France and England – and all through its history these two different cultures have been vying with each other in many ways, and one losing. TOUMANOFF: And fought a war about it. Q: Yes, that too. And the arrogance of the victorious British colonials, and the opposite French arrogance in complaining about the Anglo presence and activities. That to me is pretty much the underpinning of the separatism. In a sense the Québecois won. In fairly short order they got what they wanted, respect if not honor, dignity, and more elbow room to run their own affairs within the confederation, including more equal terms to compete with the Anglos. TOUMANOFF: …I’d put Québec into the following context. It seemed to me even then that the speed of change in the context of human life was increasingly disorienting people. Put another, narrower way, scientific and technological development and application, for example, was out of societal control and accelerating. Not just their subject matter, but especially their effects on peoples’ lives were outstripping common comprehension, as well as the institutions societies had created for some sort of orderly governance of our lives. In noble, and sometimes ignoble, efforts somehow to manage we were creating civilizations too complex for anyone to understand. The forces determining the daily fate of individuals, and of ever growing masses, seem gargantuan, infinitely beyond our capacity to influence, or even anticipate. The result is not conducive to global mental health. Much follows from that aspect of our reality, some of it is about Canada. It is easy to generate anti-Americanism. We are the origin and engine, not to say main if selective beneficiary and common victim, of most of those forces. How else could Trudeau succeed when Canada’s evident prosperity in every realm (perhaps excepting weather) is a product of the United States? I judged, and still do, that the real forces loose in our world are of such potency, and accelerating, that short of a raging civil war which seemed most unlikely, whether Québec seceded or it didn’t secede was not going to govern the welfare of the Québécois, or the Canadians, or the United States: That separatism might be interesting, but didn’t really matter very much. Now that would have been the wrong thing to say out loud in Canada. And peace between us, and the wisdom of the United States in, for goodness’ sake, not taking sides on any of those internal French/Anglo issues, and Trudeau’s French sense of scorn and superiority and the Québecois arrogance about Anglo-Saxon and American culture being part of that whole picture – it still struck me that other forces, not government control, were going to command the destiny of that nation, our own nation, and the world at large. And it seems to me that that’s happening ever more. Q: Did Quebec raise its head, the Quebec separatists of issue, during the 1981 to 1985 period? NILES: Not too much, but it is interesting that you ask about that. In 1976, of course, Rene Leveque was elected Premier of Quebec. In 1980, he had a referendum on independence which failed fairly spectacularly, 60% to 40%. Everybody thought that this was the end of Quebec separatism. The next year, however, Rene Leveque had a provincial election and won another fairly convincing victory. So, you had a separatist government in Quebec City, elected by the people of Quebec, who at the same time had rejected the independence option in the 1980 referendum. Leveque, at that time, was in declining health. Literally never without a cigarette, he resigned in September 1985 and died of lung cancer that December. Even though his Parti Québécois won the election in 1981, a lot of steam had gone out of that particular phase of the Quebec separatist issue. We took the position which we have maintained ever since, which was to keep out of that particular fight, although no one ever doubted that we opposed the independence of Quebec. Our stance was: we value very highly our relationship with a strong and unified Canada. But the question of the status of Quebec within the Canadian Confederation is a matter to be settled by the people of Canada. Q: During this period, 1981 to 1985, there were no referenda there, so it really wasn’t an issue? JONES: We began to focus even more pointedly on the run-up to the referendum in Quebec. I was meeting regularly with the federal group that was monitoring how the federal government was going to handle and coordinate the “No” campaign, the “Yes” campaign being run by the Quebec sovereigntists and the Parti Québécois. So, you had two umbrella groups in Quebec, the Yes and the No campaigns. They had a variety of financial restrictions and controls associated with who could contribute money and how it came. As a result, one of the endless arguments was the degree to which federal intrusion into what was the responsibility of Quebeckers to determine was one of the sub-themes in the referendum. 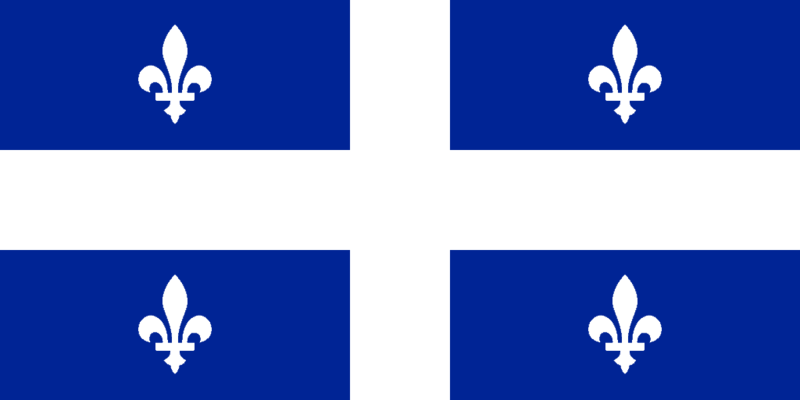 By early September 1995, the Quebec government announced the official question, which was a vague, elliptical question that had a variety of circumstances to it, including reference to a large document that had been developed beforehand as to what kind of circumstances had to be created for a new relationship between Quebec and Canada. The point really was that if you voted “yes,” you were going to have an independent Quebec in one form or another. 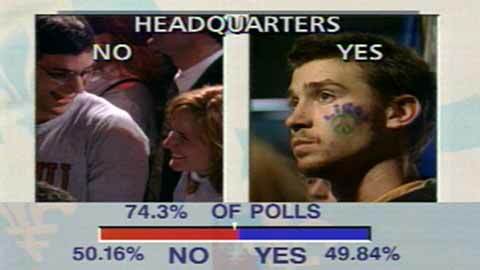 If you voted “no,” you would have a continuation of the existing circumstances…. What happened in early-mid October was that Lucien Bouchard, who had opposed having the referendum at exactly the time for what it was scheduled and had been a secondary character in the campaign until then, was, in effect, brought to the fore and virtually given control of the remaining portion of the campaign. Bouchard had a “career year” type of campaign. This was a man who had come back from death’s door, who was viewed as a monumental figure, and that his efforts were all but miraculous in survival. He is a man who was not a natural politician. He had even been a rather poor politician in his early stages. But he developed communication and speaking skills that were as good as any Quebecker has seen in a generation. People just flocked out to see him. People rushed just to touch him. People went wild over him…Bouchard, as a result, virtually single-handedly drove the Yes vote up. He drove it up to the point where immediately prior to the referendum it was too close to tell…. So, the weekend before the referendum, the embassy caucused on what the result was going to be. I said that the No vote was going to win, that the Federalists were going to win, that it was going to be very close but the Federalists were going to win. I said that we should be able to send a telegram to the Department making that prediction. The Ambassador declined, suggesting a “too close to call and Canada will still be here on the morning of the 31st”-type of telegram, which is the telegram that we sent…. At that point, people spent a good deal of time ruminating over what the next steps for Quebec would be, whether it would mean there would be another referendum in the near term or whether it would be something in the further term, how Quebec and Canada would resolve their continued differences, whether some of the promises that the Ottawa government had made so far as giving Quebec additional powers and position and circumstances would come into effect for whatever. Bouchard decided that what he wanted first to do was to prove that sovereigntists could really demonstrate good government, that they had spent the first year of their mandate preparing for and really running this referendum, and that now, if they were going to be successful, they had to show that they were a real working, effective government and worthy of an endorsement to be an independent country.